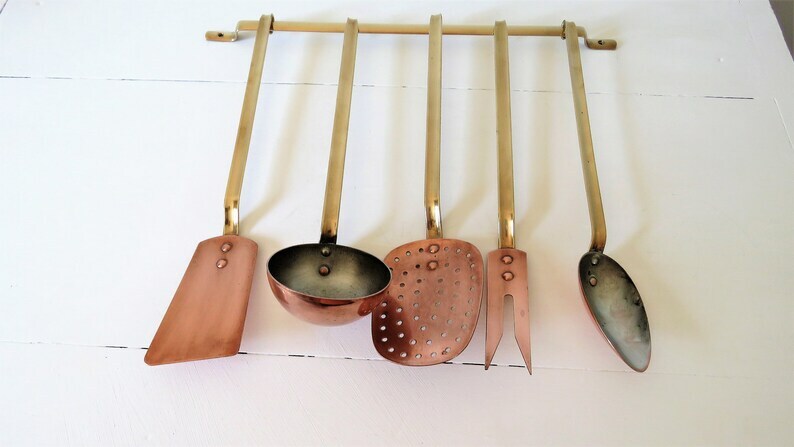 Beautiful vintage French, set of copper and brass kitchen utensils. Very good quality and a good weight. The ladle and the spoon are tin lined. The rail is solid and strong. Made from copper with brass handles and copper rivets. These utensils have been used in a professional kitchen. Great addition to a farmhouse kitchen. A nice vintage addition, to your whole batterie de cuisine, for use around the stove. All in very good condition. The weight of these utensil sets, is often a very good indication of their quality.